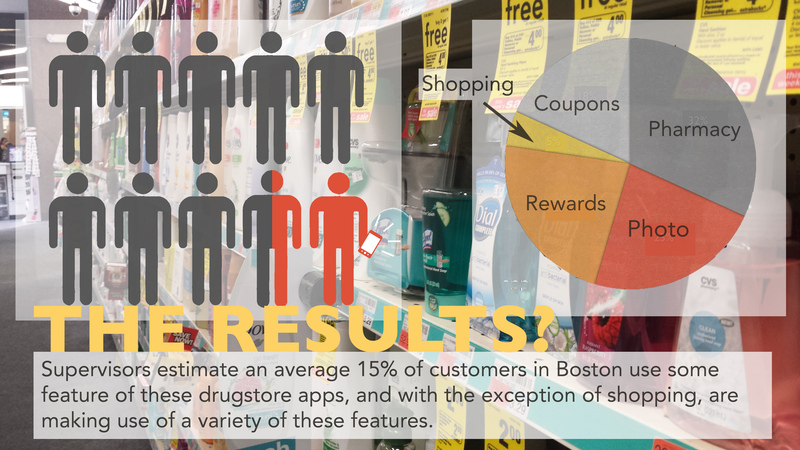 Are Drugstore Mobile Apps Useful? When it comes to mobile apps, a recent study shows that Walgreens and CVS are easily winning retail’s user favorability contest. But what does this mean, exactly? Although the study pitted drugstore mobile apps against those of other retailers, I was skeptical that people are now suddenly buying their paper towels and AA batteries through their phones. To investigate this phenomenon, I tested out the apps myself, with special attention on the shopping features in particular. 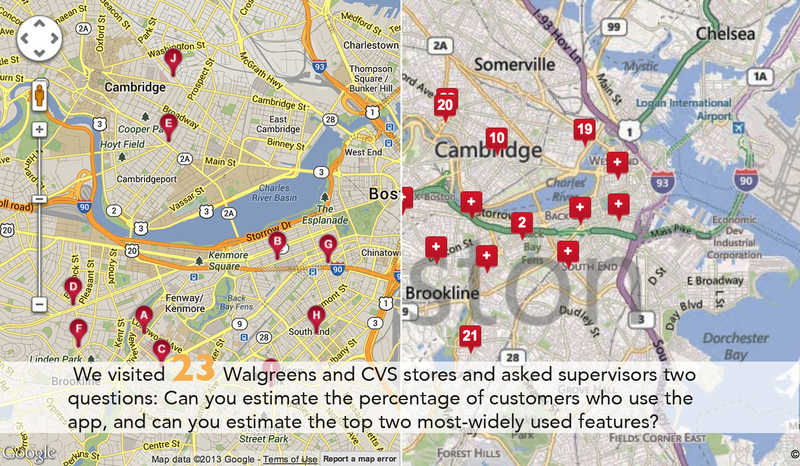 I also asked supervisors at over 20 Walgreens and CVS locations across Boston to estimate app usage in their stores. I was curious to find out who are using the apps, what they are using them for, and most importantly, if the apps were worth downloading for myself. Who are using the apps? Shortly after stumbling across the user favorability study, I ventured into my neighborhood Walgreens to start doing some research. Who were all these satisfied app users anyway, and how many of them do I stand in the checkout line with on Sundays? It was a hot June afternoon and a handful of people had taken refuge in the air-conditioning, all noticeably app-less. I went to find the manager. At this particular store, tucked away where Cambridge meets Somerville, the manager estimates only about 10% of customers actively use the app. I proceeded to visit 22 more Walgreens and CVS stores across the city of Boston, and the manager’s hypothesis didn’t quite seem to jive with my results. Sure, branches in Chinatown and the Longwood Medical Area ballpark app usage up to 25%, but stores in the heart of bustling Downtown Crossing and Copley reported estimates similar to that of suburban Somerville. A correlation between city and suburb didn’t quite paint the whole picture. But because mobile data is not aggregated by individual store, managers were quick to point out that they only know what they see. 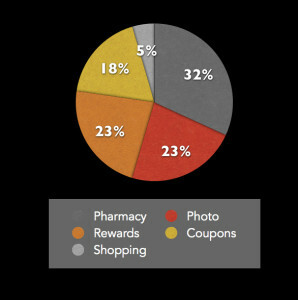 I also asked them to tell me the top two app features customers use the most, and the pharmacy was easily the most cited of the bunch, followed by photo, rewards, and coupons. However, most of the pharmacy features – refilling and transferring prescriptions, making clinic appointments, etc. – are popular precisely because they limit time in-store. In 23 store visits across three separate days, I saw a total of five people use the app, and all to scan their rewards cards through their phones. I had to remind myself that this was not representative of the whole. There are most likely more app users than we observe. I averaged the percentage of estimated app users across all stores surveyed and got a number just above 15%. On average, 15 out of 100 CVS and Walgreens customers use their phone in some capacity to facilitate their in-store activity. 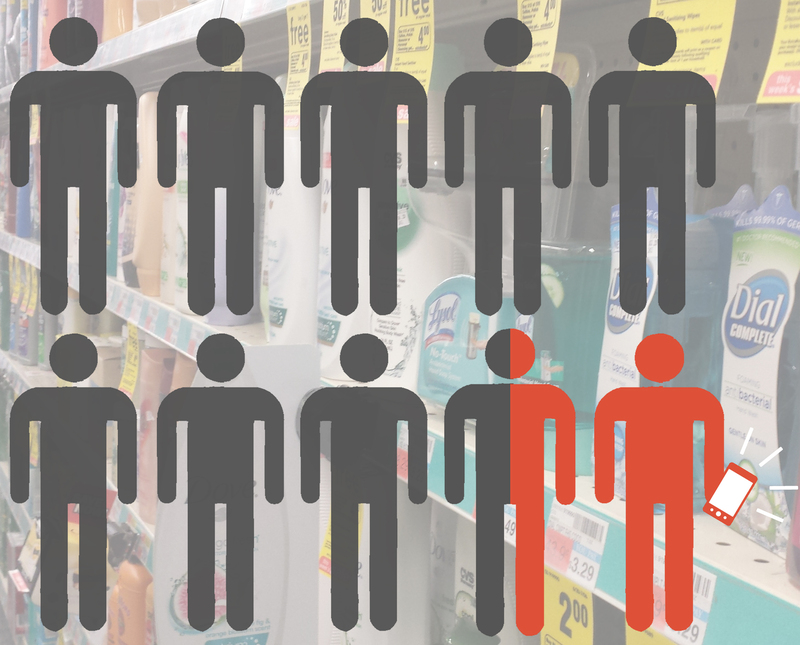 Not bad, if you consider how varied the typical consumer demographic is at any given drugstore. But the numbers alone were too low to be persuasive in their own right. I had to try out the app. What are the apps good for? If I’m tossing a pair of jeans into a virtual shopping cart (and thus forgoing my often-fruitless pile dive for my size at American Eagle), mobile works wonders for retail. But there’s a nostalgia tied to perusing drugstore aisles that makes ordering household goods in the same fashion a more preposterous concept. Well, as it turns out, that’s not what these apps are after anyway. According to a recent internal study from Walgreens, customers who combine the mobile app with in-store shopping spend 4 times as much as the average app-less customer. Thus, instead of replacing one mode of shopping with another, the goal is multichannel retail – enhancing a customer’s experience by providing a variety of transaction processes. With that in mind, both Walgreens and CVS have hit the nail on the head in the design of their apps. Both successfully compress the sensory-overload of a fluorescent, overstocked drugstore into a series of easily digestible categories, many of which do a first-rate job of anticipating customer needs. People don’t have a pressing need to order Kleenex on the go, but they do save a lot of time refilling prescriptions, ordering photos, and making clinic appointments through their phones. Both apps clearly prioritize health and drug resources above all others. They also introduced solutions to problems I didn’t realize I even had. Of course, now I’ve linked up my ExtraCare card to my CVS app, but it wasn’t all that bothersome before now to keep a plastic card in my wallet – or punch in my phone number when I didn’t. Walgreens lets me upload photos straight from Facebook and Instagram, and provides me with a nifty barcode scanner so I can look up prices to my heart’s content. These features might seem frivolous, but I’m quite impressed by both companies’ efforts to step into the shoes of the customer. So have their efforts at cultivating brand loyalty done their magic on me? Perhaps. I still, however, needed to check one more thing. With the Shop buttons buried amongst the bevy of pharmaceutical options, it’s clear that neither of these companies really prioritize the shopping experience itself. But I was curious to see how these stores, with notoriously extensive inventories, attempted mobile shopping. The Slide Share illustrate my experience with both apps as I shopped for the most exciting household product I could think of: laundry detergent. So do the apps deserve the hype? Wary traditionalists, rest assured – your habitual stroll down the paper goods aisle need not be compromised by the arrival of the app. But while drugstores don’t currently require a smartphone upon entry, the folks at CVS and Walgreens have done such an incredible job of streamlining processes and anticipating your needs that these apps could revolutionize your experience if you let them. I personally won’t shop at either store the same way. I loved having the ability to sit on a park bench with nothing but my phone, choose some photos from Facebook, order prints, and pick them up in-store an hour later – and swipe my rewards card while I was at it. To complete my recent move, I’m about to transfer my prescriptions to a new pick-up location, and you can bet I’ll be doing it through my phone rather than waiting in line. I’ll still most likely be purchasing laundry detergent the old-fashioned way though, but hey, at least I can check deals on my phone before I get to the store. Long story short: download the apps. For the thirty-odd seconds it takes from App Store to shortcut button, these (free!) apps will be worth your while.